This time of year we absolutely love using local, in season produce and have combined some of our favorites into this grain free, paleo galette recipe. 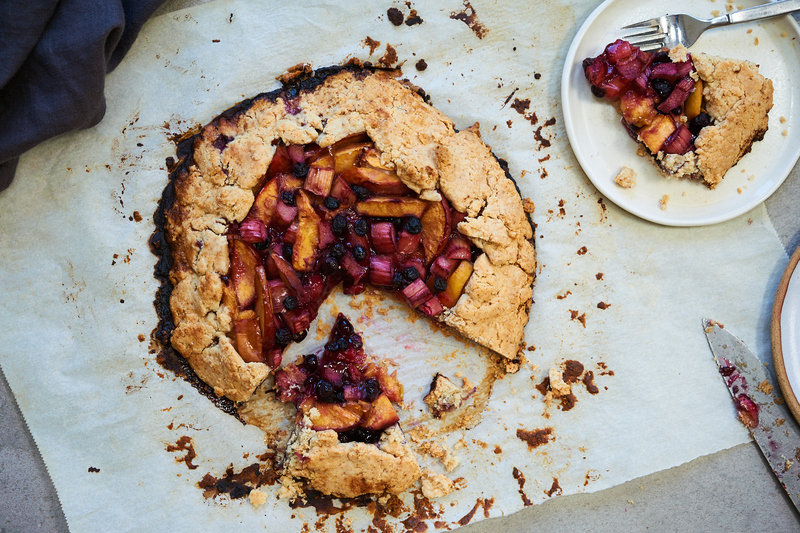 The crust is gluten free and filled with peaches, blueberries, and fresh rhubarb from the market. Making a galette is easier than making pie, especially if you like the rustic appearance of dough folded over juicy, baked fruit. You can eat this for dessert or even as a snack or for breakfast, since it’s packed with nutrients and low-glycemic. Rhubarb is an excellent source of fiber, calcium, iron, vitamin K (which helps support strong bones) and manganese. Rhubarb also is a good source of the antioxidant vitamin A, which is an important nutrient for skin health as well as contains vitamin C and lutein which are both needed for healthy eyesight. Its fiber content supports digestion and is a great plant food to include in your diet to help make sure that waste is being removed properly from the body. Most importantly, rhubarb also contains a pigment called parietin which studies have shown to potentially aid in fighting cancer and research is being done to see if parietin can effectively be used as a cancer drug. Besides all of the nutritional benefits of rhubarb, it adds a delicious, tart flavour to this galette. Both the crust and filling are sweetened very lightly with coconut sugar. Coconut sugar, one of our favorite sweeteners to use in baking, is a healthy alternative to white sugar since it’s unrefined. This means it contains vitamins C, B1, B2, B3, and B6. Since coconut sugar is made from dehydrated coconut sap, it also contains calcium, magnesium, potassium (400 times more than regular sugar), zinc and iron. The biggest reason that we love coconut sugar is because of its low glycemic index, that comes in at 35, as opposed to the high glycemic index of white sugar at 68. This means that coconut sugar will not spike your blood sugar in the way that white sugar and other refined sweeteners do. Since peaches are naturally sweet, we don’t need to use a lot of coconut sugar in this recipe, but a little bit helps make the rhubarb taste sweeter. If you have other fruit on hand, you could always try subbing in different types of berries, nectarines, pear or apple instead. You also could omit the coconut sugar completely if you are on a low-sugar diet and want to simply enjoy the natural sweetness of fruit. We hope that you’ll give this gluten free, paleo and grain free galette recipe a try! Mix together the almond flour, tapioca flour, coconut sugar and sea salt in a small bowl. Then pour this mixture into a food processor. Add in the butter or coconut oil and pulse the food processor to make a crumbly mixture. Then add the egg and pulse until a dough comes together. Be careful not to overblend the mixture. Take the dough out of the food processor and form into a ball. Place between two sheets of parchment paper. Roll out the dough with a rolling pin (or wine bottle) until it’s thin. Prepare the fruit and rhubarb and toss together in a bowl with lemon juice, tapioca flour and coconut sugar. Pour the filling into the center of the dough and fold the edges of the dough in toward the center, so there is about 1 to 2 inches of dough covering the filling. Keeping the galette on the bottom piece of parchment paper carefully slide the parchmet paper onto a baking sheet. Bake for 30 minutes, until the center is bubbling and the dough is cooked.